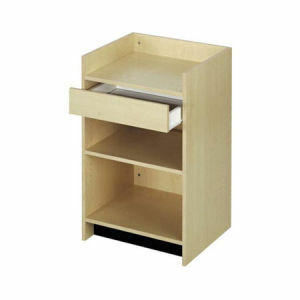 Dimensions: 38" x 18" x 24"
Ready-To-Assemble Register Stand - Each ready-to-assemble showcase comes with a 4" kick plate to match other components in this collection. Features convenient cash drawer and 4" recessed counter. 2' Stand - 38" x 18" x 24"
Shipped: All items listed below come in 1 flat carton.